The vast majority of annuals and perennials grow best in full sun. Most varieties will also grow in partial shade but may grow leggy and produce fewer flowers. For the most blossoms, put plants that prefer full sun in full sun. When gardening in Minnesota, it is necessary to grow plants that are hardy enough to survive the bitter cold of Minnesota's winters. Most native prairie wildflowers are hardy in southern Minnesota's zone 4, with several hardy into Minnesota's northern zone 3. Many of these prairie wildflowers are native to the sun-drenched prairies of southern Minnesota and are some of the best choices for growing throughout the state. With bright yellow petals that morph into bright orange-rust centers, the annual wildflower known as blanketflower (Gaillardia x grandiflora) is another of the many daisy-like native American wildflowers. It prefers full sun and soil a little on the dry side, although it will produce more flowers if watered occasionally during dry spells. Blanketflower is hardy through USDA zone 2 and will grow well throughout all of Minnesota. It grows to a height of 18 to 24 inches and blooms continuously from June through October. Other than aphids or powdery mildew if planted too close together, blanketflower is not bothered by pests or diseases. Wormwood (Artemesia spp.) is a large and varied herbaceous plant species with varieties used for everything from pest control, medicine, flavoring vermouth and even to make the controversial beverage absinthe. It is native to Europe, northern Africa and western Asia. Wormwood comes in perennial, biennial and annual varieties and is a member of the sage family. It grows best in full sun and prefers slightly infertile soil. All varieties of wormwood are very vigorous growers and can become invasive in pastures and farmland. Depending on the variety, wormwood is hardy in zones 2 through 7 and will grow throughout in Minnesota. Widely grown for the cut flower trade, globe thistle (Echinops spp.) is a tall, clump-forming perennial that grows to a height of about 4 feet. It will grow in virtually all soil types but prefers dry conditions and full sun. 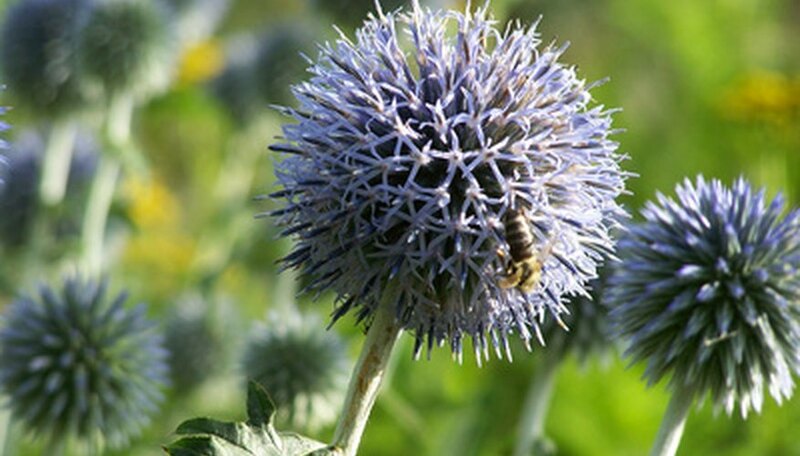 Globe thistle produces large, thistle-like flowers on long, hollow stems. It blooms from July through August and is hardy through zone 3, making it an ideal garden plant anywhere in Minnesota. One of the most widely grown flowering annuals, cosmos (Cosmos bipinnatus or C. sulphureus) grows quickly in full sun and produces flowers all summer until killed by frost in autumn. C. bipinnatus has finely cut leaves and flowers in shades of white, pink and rose. It grows to a height of 4 feet under ideal conditions. By contrast, C. sulphureus only grows about 2 feet high. Its leaves are not as finely divided as C. bipinnatus and its flowers are shades of red, orange, gold and yellow. Both types prefer full sun, fertile, well-drained soil and greatly benefit from applications of fertilizer throughout the growing season. Cosmos is a prolific reseeder, often producing volunteers that pop up throughout your garden in mid-spring.